WATER SPORTS? NO PROBLEM! Doesn\'t matter if it\'s a splash, a spill, or total immersion, the Waterproof Pouch (2 Pack) from FIRSTBUY has you covered with trusted Triple Seal Protection up to 32 feet (10 meters) underwater. Whether you\'re snorkeling, swimming, or sailing, you\'ll never have to worry about drowning your expensive Smartphone or wallet! DOUBLE THE PLEASURE, DOUBLE THE PROTECTION - Off to the beach or relaxing poolside? The translucent pouch is Touch Screen-Friendly, enabling you to text and talk while you soak up some sun. Going on a cruise or island hopping tour? Protect your cash, credit cards, and passport in the opaque pouch, so thieves cannot ruin the vacation of a lifetime. EXTRA LARGE FOR EXTRA FUN - At 9.0\" X 6.7\", our deluxe waterproof bags are extra spacious, so you can stay connected and protected while having the time of your life - they can float too. Take your iPhone 6 Plus, Galaxy Note 5, camera, money, sunglasses, earphones, sunscreen, snacks, and other must-have items. You can even fit one iPad Mini 1/2/3. EXTRA LONG FOR EXTRA COMFORT - Tired of straps that are way too short, flimsy, or easy to lose? We made sure our fully adjustable carrying straps fit you comfortably as a waist pack (fits sizes: 33.5\" - 47.5\"), cross-body bag, or shoulder bag. Sturdy. Secure. Stylish. Your can\'t-live-without essentials will always be at your side - on land and in water. 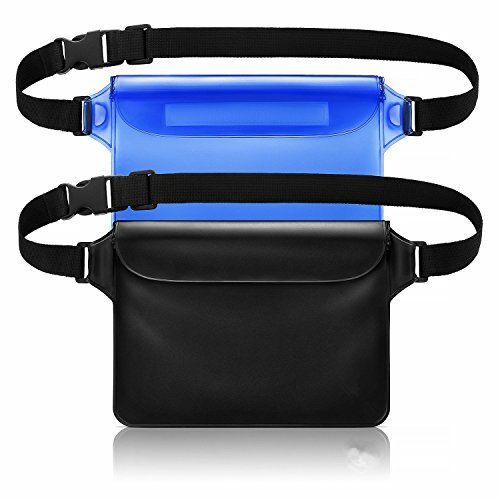 FREE 100% GUARANTEE - Join thousands of water lovers who depend on the Blue Sky Basics Waterproof Pouch Set for 3-in-1 protection from water damage, theft, and loss. Try them out for yourself completely risk free. Your phone and wallet will thank you for it! Keep Your Phone Safe in a Splash Zone!